Today is Thursday and I’ve started planning this last weekend of May in Florence since from the next one we Florentines generally like to leave the hot city for the seaside or the countryside, even if I personally am fine with a little bit of warm sunny days. 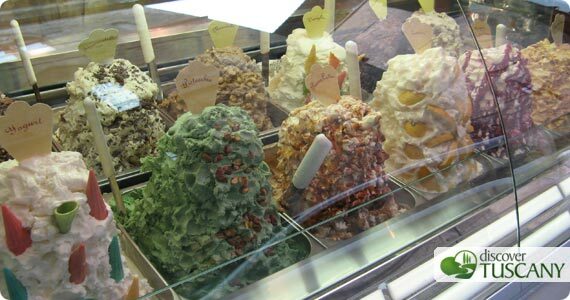 My attention is focused on the eagerly awaited Florence Gelato Festival. It looks like Florence will turn into the international capital of ice cream from May 28th to 31st. The last 4 or 5 weeks the event has been advertised and sponsored everywhere, from newspapers, magazines, blogs, ads on streets and on buses. The festival takes places in different areas in Florence’s city center, in Piazza SS. Annunziata, Piazza Repubblica, Piazza S. Giovanni and Palazzo Vecchio. There are local, national and international ice cream makers, that means lots of ice cream to taste! First step is to get myself a Gelato Tasting CARD. The festival is free, but tastings are paid (1€ each). The card is sold online, at infopoints in Piazza SS. Annunziata and Piazza S. Giovanni and at the tourist office in Piazza Stazione 4 (in front of S.M.N. Station). The program of the Gelato Festival (in Italian) is rich of events. In addition to ice cream tastings, there are live demonstrations of master ice cream makers, workshops, meetings and exhibits, all connected to ice cream. Besides this “delicious” festival, from May 29th to June 5th the Classico è event in Chianti will be promoting wine and culture of Chianti Classico. I’d like to go to Panzano in Chianti on Sunday, but Sunday is also Cantine Aperte, or “open wineries”, the most important event for wine tourism every year. This year there is a Wine Shuttle that drives you from Siena to Montepulciano and Montalcino for wine tastings. In addition, if we have good weather, I want to visit the Museo Bardini which is hosting one of the first examples of Marzocco (the lion symbol of Florence) just recently restored. And I want to go to Villa Bardini for the exhibit La Grande Madre – The Big Mother – displaying beautiful statues by Giuseppe Gavazzi.